RED BULL GAVE US WINGS !!!! 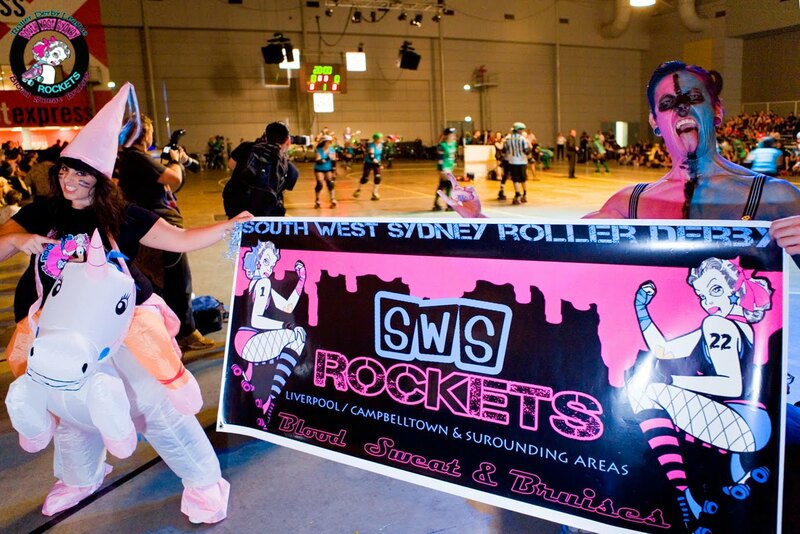 South West Sydney Rockets "Red Bull Roller Ragers" Inter-league games held over the weekend in Queensland, hosted by Northern Brisbane Rollers kicked off with a Bang !! Before the games had even started The RBRR Squad from South West Sydney could hardly contain there excitement, and as the games drew closer the anticipation was almost too much to bear. 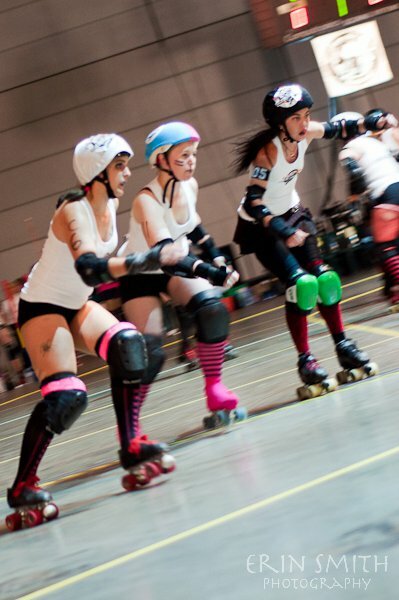 With Kimakaze #44, Killawatts #21, Dita Von Bruiser #11 and Dolly Death #66 representing NSW from South West Sydney Rockets for a chance to win $10,000 in prize money generously donated by Red Bull, the fun was about to begin! 7 Leagues, 5 games, 4 girls from each league representing !! 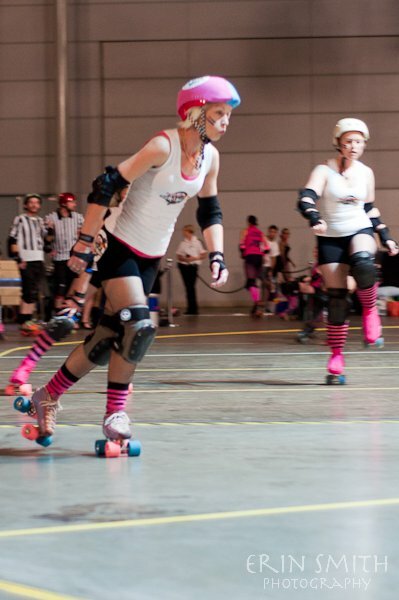 unable to make up the time lost, it was Kimakaze up next to skate for the team, flying around the track, gaining time lost in the pile up, bringing it home for SWSR coming in a fast and proud with 4th place in this fun relay race that showed our star passing skills whilst in the 10ft zone along with our speed and agility . 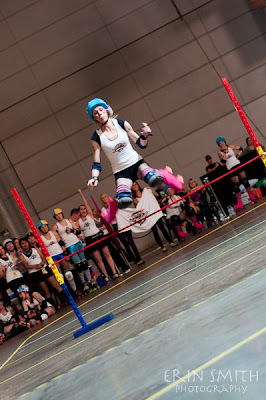 But it was Kimakaze who made the crowds cheer and took home first place with her fantastic derby slide underneath the 30cm limbo pole..and Congratulations to Original Sindy who came an amazing 2nd. Kimakaze and the Winning Slide that won the Limbo !! 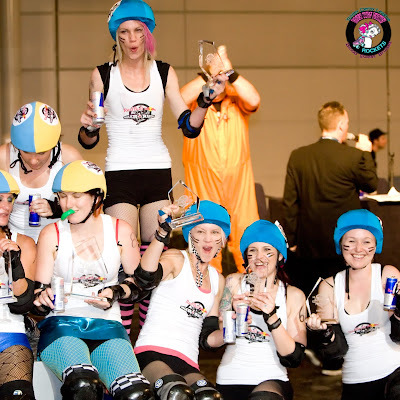 The Third event was the Red Bull Roller Ragers Bash'N'Grab, showing jamming/blocking and barging skills, one girls from each league skated. It was Kimakaze representing South West Sydney Rockets, starting on the outside Kimkakze managed to wizz around the track snatching the baton to come in 4th knocking out 3 girls in the first heat, in the second heat SWSR were not so lucky, with Kimakaze being pipped at the post and coming in to take 4th. The last heat was a skate off between 3 Queensland girls, with Niki Nitro taking home 1st, Congrats !!! Starting line & the Whislte blows ! 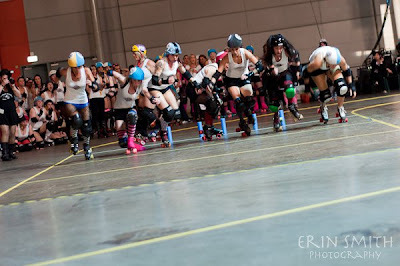 The 4th event was the Red Bull Roller Ragers High Jump, with all 28 girls competing; it was a test to see who could jump the highest (Showing you can jump over a pile of fallen skaters easily) and still be left standing to skate away. 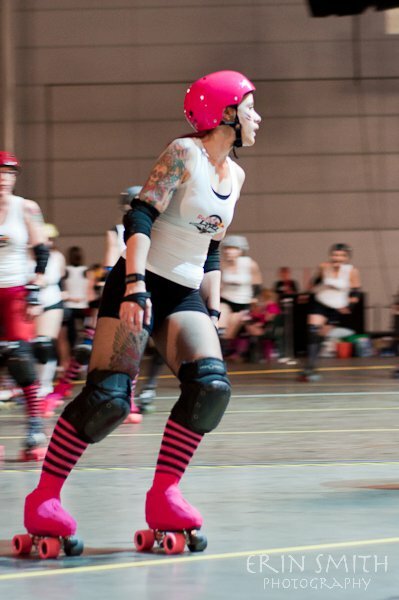 Dita Von Bruiser did an amazing job, making it down to the the last 10 girls, with Killawatts showing her amazing skills jumping the stick to be knocked out in 5th place. As the pole got higher and higher the crowd could not believe there eyes, and it was South West Sydney's Kimakaze and Deat Meat from Northern Brisbane Rollers who were the last two girls standing, Kimakaze made a perfect 80cm jump clearing the stick with ease, but it was when the bar was raised to 85cm Kimakaze was not so lucky, clearing the pole but knocking it with her wheel on the way down it was Northern Brisbane Rollers Dead Meat who took home 1st clearing the 85cm with style. Kimakaze bringing in 2nd for SWSR and Congratulations to Deat Meat who showed off her amazing jumping skills !! 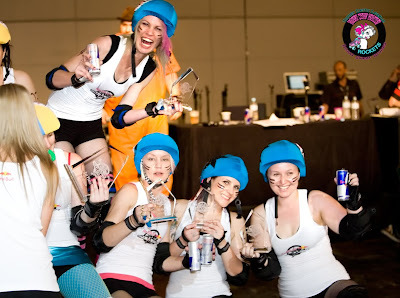 Last up was the Red Bull Roller Ragers Queen of the rink, with all 28 girls competing showing there blocking and barging skills, until the last one standing wins. South West Sydney yet again showed there agility and skills and proved a force to be reckoned with, with Dolly Death skating nicely, sticking to the track and getting low, but sticky feet didnt help when 28 girls are after you, and Dolly was knocked out in a corner. 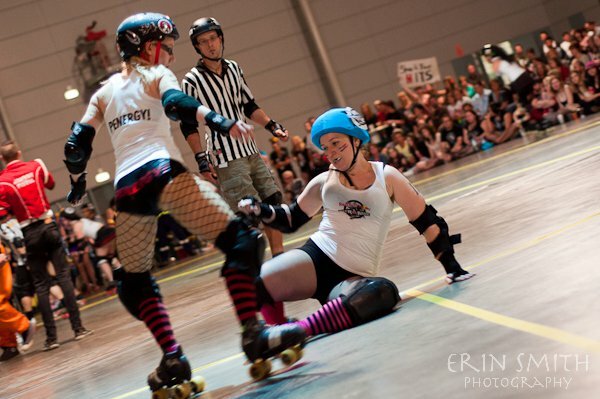 Dita Von Bruiser showed her prowess staying down low, skating with great form and blocking and barging the other girls out of her way, staying in the game long, Dita was barged out by Penergy only to have Killawatts and Kimakaze remaining. Killawatts was next to go with barges and shoves coming at her from every angle, Killawatts was sandwiched a few times and received a nice kick to the back of the leg with a skate leaving an awesome bruise for her in the morning but unfortunately she was knocked out at #6 place. It was left up to Kimakaze to make up more points for SWSR, with only Queensland teams remaining on the track, Kimakaze from Sydney became there new target, Niki Nitro stayed close and snuck up in the corner to take Kimakaze out in 4th place. 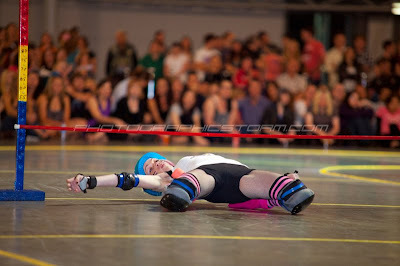 With only three QLD players remaining, it was Alice Affliction of Gold Coast who took home the 1st... congratulations ! With the points accumulated South West Sydney Rockets couldn't have been happier to have taken home THIRD PLACE in this first ever Red Bull Roller Ragers Inter-league Games and brought back for the SWSR girls $1,000 to help us on our way, in our first bouting season for 2011!! A big thank you to RED BULL & NBR !! Also SWSR would like to send a shout out and a big thank you to some amazing photographers who captured some awesome images from the night, like the ones above; please go to the below links to view some more amazing photos of this awesome Red Bull Roller Rager Inter-league Skills Comp and see more SWSR girls in action ! !